Birthday videos will differ, to some extent, depending on the nature of the celebrations that are planned and of course, the age of the person whose birthday it is. 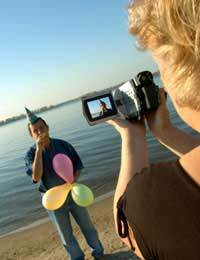 However, although the composition of the video may differ, there are some key scenes which should always be included and some tips and skills which can be utilised to create a successful birthday video. Firstly, you’ll want an establishing shot of the exterior of the venue or location at which the celebration will be held. This could be the outside of a house, a church, a village hall, a school, on a beach – in fact, it could be anywhere but you need to capture the place where the celebration is being held from outside the venue, followed by another scene of the guests arriving. This could include a meeting and greeting scene or a shot of children playing. If there are ‘special guests’ at the celebration, ensure that they are included and given prominence on any meet and greet scene – a child’s grandparents, for example, if it’s the child’s birthday. This introductory scene should reflect the ‘coming together’ of everybody in order to celebrate together so adults laughing and talking and children playing help to establish a sense of ‘fun’. The action should then centre on the main location where the actual announcement of the birthday celebration will take place. Wider shots are needed here to illustrate the decorations which have been put up, honing in on any unique or funny, personal banners or balloons which might say something complimentary or even witty about the birthday boy or girl (or man or woman) and shots of people enjoying the food and drink. If you have hired an entertainer, make sure the highlights of their act are also included. The speech that gathers everyone together to light of the candles on the cake. Any other scenes of enjoyment and everybody having a good time. No doubt music will have taken over by then as people dance and let their hair down but if the mood were slightly more formal, this would be the right point during editing to incorporate appropriate background music into your video. This should include the guests leaving the venue, with any last minute hugs and kisses taking place included too. Depending on the formality of the celebration, it’s sometimes fun to film the aftermath, in terms of the mess that’s been made, showing that everybody got ‘stuck in’ to the celebrations and enjoyed themselves. Finally, the video should be brought to a close with, perhaps, just the birthday boy/girl reflecting on the celebrations with just a few close friends or relatives that have remained behind and, maybe, some close ups of tributes paid to the birthday boy/girl by their nearest and dearest and maybe some words of thanks from the birthday boy/girl themselves to round off with.